Mark 1 recounts Jesus’ healing of Peter’s mother-in-law (at your own risk, insert joke about not wanting to see your mother-in-law healed). Having worshipped at Capernaum’s synagogue, Peter brought Jesus home and amazing things happened. It’s always a good idea to bring Jesus home from church! When you bring Jesus home, amazing things happen! Occasionally, we might bump into Jesus during the week at a prayer meeting or a small group gathering. For the most part, though, our interactions with him are limited to Sunday morning. 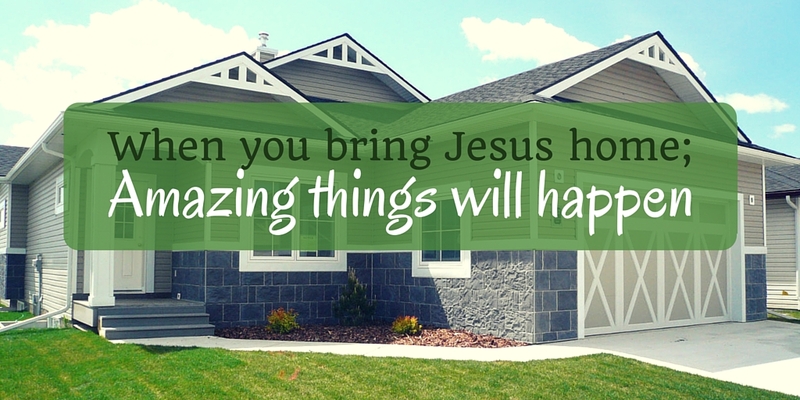 Imagine for a brief moment how your life might change if you brought Jesus home with you after church every Sunday. He could ride to work with you Monday morning; and as long as you don’t leave him in the car, he will join you as you do your job throughout the week. He could go to your kid’s sporting events with you. He might even put a hand on your shoulder occasionally to remind you to represent him when you yell at the referee, coach or players. He could be in the kitchen with you while you hash out a disagreement with your spouse. Would that change the way you listen? Would it keep you from interrupting? Would it remind you to speak with more loving words? Would you be more gracious? He could be the first person you speak to in the morning and the last person you engage at night. I imagine there is little question that Jesus would improve your life if you took him home from church. So maybe this Sunday, don’t leave without him!